The objective of the present research was to determine the influence of various doses of the pellets containing DR seed meal (PEDEM) on in vitro CH4 gas production, in vitro digestibility, protozoal count, and ruminal fermentation characteristics. The study was designed as a completely randomized design with eight levels of PEDEM supplementation at 0, 2, 4, 6, 8, 10, 12, and 14 mg DM. Gas production rate constants for the insoluble fraction (c) and cumulative gas production at 96 h were quadratically increased when PEDEM was supplemented (P < 0.05). The concentration of NH3-N was linearly increased when the PEDEM concentration (P < 0.05) was increased, whereas the population of protozoa was linearly decreased when the level of PEDEM supplementation (P < 0.05) was increased. The supplementation of PEDEM in substrate quadratically affected the mean values of in vitro dry matter digestibility (IVDMD), in vitro organic matter digestibility (IVOMD), and in vitro NDF digestibility (P < 0.05). TVFA, acetic acid (C2), and butyric acid (C4) were not altered by different doses of PEDEM supplementation (P > 0.05). In contrast, the concentration of propionic acid (C3) was quadratically affected with the supplementation of PEDEM (P = 0.05). The inclusion of PEDEM did not change the CH4 concentration at 6 h of incubation (P > 0.05), whereas the CH4 concentration at 24 h of incubation and the mean values were linearly reduced with additional doses of PEDEM (P < 0.05). Compared with the control group, the mean CH4 concentration was reduced at 51.1% with 12 mg PEDEM, whereas 59.6% was reduced with 14 mg PEDEM supplementations. The supplementation of PEDEM at 12 mg has the potential to manipulate rumen fermentation, to manipulate in vitro digestibility and to reduce protozoa and CH4 production. 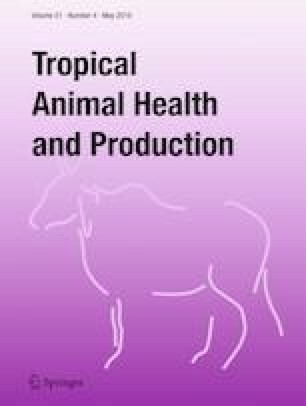 The authors would like to express their most sincere thanks to the Increase Production Efficiency and Meat Quality of Native Beef and Buffalo Research Group, Khon Kaen University (KKU), for the use of the research facilities. This study is financially supported by the Thailand Research Fund (TRF) and Office of the Commission on Higher Education through the Research Grant for New Scholar (grant no. MRG6080003) and Increase Production Efficiency and Meat Quality of Native Beef and Buffalo Research Group, Khon Kaen University (KKU). This work was also supported by the TRF though the Research and Researcher for Industry (RRi) program (contract grants PHD60I0080) and TFR-IRG5980010.